An Inner Circle train arrives at West Street station. 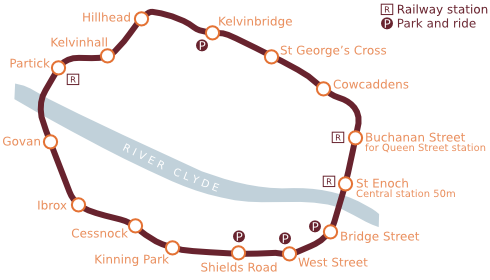 The Glasgow Subway is a metro system in Glasgow, Scotland. Opened in 1896, it is the third oldest subway system in the world after the London Underground and the Budapest Metro. Originally a cable railway, the Subway was later electrified, but its one circular line has never been expanded. Officially called the Glasgow Underground between 1936 and 2003, it has reverted to its colloquial name of Subway. It remains one of only two underground metro-type systems in the UK outside London, the other being the Tyne and Wear Metro. The Subway has been policed by British Transport Police since 2007 . One of the few long-lived metro systems that have never expanded from its original route, its circular route is almost 6.5 miles (10.4 km) long and extends both north and south of the River Clyde. The tracks have the unusual narrow gauge of four feet (1219 mm), the tunnel diameter of 11 feet (3.35m) comparable to that of the deep-level lines of the London Underground (11'8" or 3.56m). A £40,000 study examining the feasibility of an expansion into the city’s south side is in progress. The subway is not the oldest underground railway in Glasgow itself; that distinction belongs to a 5 km stretch of the North Clyde Line of the suburban railway network which runs in a sub-surface tunnel under the city centre between High Street and west of Charing Cross. The subway’s running lines are entirely underground, but the maintenance depot at Broomloan Road (located between the Govan and Ibrox stations) is above ground, as was the earlier depot, also at Govan. Prior to modernisation, trains used to be hoisted by crane onto and off of the tracks. Modernisation brought the installation of points and a ramp between Govan and Ibrox where trains can exit the underground tunnel system to terminate for engineering, cleaning or storage. As built and opened on 14 December 1896 by the Glasgow District Subway Company, the subway was powered by a clutch-and-cable system, with one cable for each direction. The cable was driven from a steam-powered plant between West Street and Shields Road stations. There was no additional cable to allow trains to reach the depot; instead, they were transferred to and from the running lines by crane operating over a pit at the Govan workshops. This also meant that the two tracks could be completely separate, with no points anywhere. The company's headquarters were in the upper rooms at St Enoch subway station; this distinctive ornate building still stands in St Enoch Square and is now used as a travel information office. When the Subway first opened, single-carriage trains were operated. An accident on the opening day entailed the closure of the Subway until January 19 1897. The 20 original carriages were built by the Oldbury Railway Carriage and Wagon Company, of Oldbury, Birmingham, England. Many continued in service until 1977. A further 10 were delivered by the same manufacturer in 1897. From 1898, second (trailer) carriages without a cable gripper mechanism were added, though they were considerably shorter than the front (gripper) carriage. These additional carriages, eventually numbering 30, were built by Hurst Nelson & Company, Motherwell, Lanarkshire. These carriages were soon expanded to match the length of the front carriages, although carriage 41 has been restored to its original length and can be seen preserved at Buchanan Street subway station. Most of the gripper carriages were subsequently converted to electric traction in 1935. 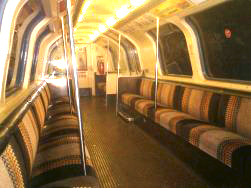 All carriages were originally built with lattice gates (instead of doors) at the ends; many were converted to air-operated sliding doors in the 1960s, but a few retained the gates until 1977. All 15 stations were built with island platforms. The trains were thus built with doors on one side only. When electric lighting in the trains was introduced, the current was supplied by two parallel wall-mounted rails (known as "T-irons") at window level on the non-platform side of the trains; trains were equipped with skids to pick up the electricity. The trains remained cable-hauled until 1935, though the anachronistic way of supplying power for the lighting continued until 1977. Glasgow Corporation took over the company in 1923. In 1935, the existing trains were converted to electric power delivered by a third rail at 600 volts, direct current. From March until December 1935, clockwise trains were cable-hauled, whilst anti-clockwise ones were electric. The trains lost their original plum and cream-coloured liveries, being painted red and white instead. From the 1950s the trains became all red — in a shade similar to that of London buses. During the early 1970s, trailer carriage number 41 was repainted in the original 1896 livery; part of the carriage, shortened to its original length, is now preserved at Buchanan Street station. After the Beeching Axe of the 1960s, both St Enoch and Buchanan Street mainline stations were closed and demolished. Ever since, the Subway has had no direct passenger connection to the national railway network — a major weakness — although an interchange to the suburban rail system exists at Partick, and a moving walkway was installed between Buchanan Street station and Queen Street mainline station as part of the late 1970s modernisation. Before the 1977–1980 modernisation, the stations had a distinctive earthy odour. The trains (mostly dating back to 1896) were always formed with two carriages — the front (motor) carriage with red leather seats and the rear (trailer) carriage with brown leather seats. Smoking was permitted in the rear carriage only. The backs of the seats were attached to the sides of the carriages, which moved semi-independently from the floor (to which the seats themselves were attached); passengers were rocked forwards and backwards while the carriage 'shoogled' them around. Passengers always entered at the middle of the train ("Q[ueue] Here" signs were painted on the platforms), leaving by the front door of the front carriage or the rear door of the rear carriage. By the 1970s, the stations were very dilapidated. Stations were marked with circular signs often attached to lampposts. This sign had a white background in the top three quarters (containing a large red letter "U") and black in the bottom quarter (containing the word "UNDERGROUND" and an arrow to the station entrance). No station had an escalator; Kelvinbridge had a lift. Each station had a ticket office (often very small, little more than a booth with a window). The ticketing system was identical to that of most cinemas of the era, with tickets emerging from slots in the counters of the station ticket offices (the words Control Systems Ltd or Automaticket Ltd were printed on all tickets). Tickets were invariably collected on leaving the train. Until 1977, the staff wore dark green uniforms, with black braid on the cuffs, which had been introduced at the time of the funeral of Queen Victoria in 1901. Glasgow’s Museum of Transport has an area dedicated to the subway, with models showing the operation of the clutch-and-cable system, as well as a full-scale replica of part of a subway station, complete with different rolling stock of the pre-modernisation era. By the 1970s, use of the Subway had declined significantly. This was caused partly by the closure of some of the dockyards and by widescale demolition of tenements south of the River Clyde. The original carriages, mostly dating back to 1896, were still in use, though adapted for electric traction in 1935. Breakdowns were becoming increasingly frequent; because trains could only be removed from the tracks to the depot by crane, a single inoperable train could cause major delays. The future of the Subway became a major issue for the Greater Glasgow Passenger Transport Executive, which took over responsibility for the line from Glasgow Corporation in the late 1960s. On 24 March 1977, cracks were noticed in the roof of Govan Cross station, leading to suspension of services until 2 May. The service resumed with only four trains per circle. On 21 May 1977, the system was shut down eight days prematurely for a major refurbishment and modernisation; the date was brought forward because of the appearance of more cracks in the roof of Govan Cross (now Govan) station. Badly deteriorated tunnels were repaired; stations were rebuilt and enlarged, with additional platforms at Buchanan Street, Partick, Govan, Ibrox, Hillhead, and St Enoch. The entrance to Kelvinbridge was reversed, with a new entrance and car park built at North Woodside Road, an escalator to Great Western Road, and stairs down to the west end of the platform; the former entrance and stairway at the east end became an emergency exit, and the lift was withdrawn from service. Merkland Street station was closed; a new station to the north was built at Partick to provide an interchange with the North Clyde suburban rail system. The site of the former Merkland Street subway station can be noticed by the characteristic hump and the larger-diameter tunnel with both tracks. A further interchange via moving walkway was installed between Buchanan Street station and Queen Street mainline station as part of the modernisation. In August 1977, all redundant fittings and equipment from the old system were sold at a public sale at Broomloan Works. During the 1977–1980 modernisation, two Clayton battery locomotives were used by the contractors Taylor Woodrow to haul construction trains. The locomotives were nicknamed Roger and Claus, the latter allegedly because of its habit of bringing unwelcome "presents" and surprises through reliability problems. Heavier track was installed (although still at the unique, 4-foot gauge); the original Broomloan Depot was modernised and equipped with connecting tracks (with points) to replace the crane transfer; and a new electrical supply, from Westinghouse Electric Corporation, was installed. A new ticketing system, provided by Crouzet, with passenger-operated vending machines and automatic barriers, replaced the old, cinema-style tickets. The post-1980 yellow tickets have since been replaced by a newer system, issuing credit-card-sized tickets. The line was formally reopened by the Queen on 1 November 1979. However, rebuilding work was still incomplete, and the line did not reopen to passengers until 16 April 1980. Thirty-three new carriages were built by Metro Cammell at its Washwood Heath works, in Birmingham, and equipped with GEC electric motors. The exterior design of the trains was carried out in partnership with Glasgow School of Art, which, according to SPT publicity films of the day, was largely responsible for the trains' "cute" appearance. Eight additional centre-trailer carriages were built in 1992 (the body shells by Hunslet Gyro Mining Transport Ltd in Leeds for completion by Hunslet-Barclay Ltd in Kilmarnock), making all trains three carriages long. Smoking has never been permitted on the modernised system. A new corporate identity was introduced (following contemporary fashions of the 1970s), with trains painted bright orange, stations largely rebuilt with dark brown bricks, orange-yellow wall tiles and other surfaces in off-white, plus brown uniforms for the staff. Large, illuminated orange "U" signs were placed at station entrances (since removed, with the re-adoption of the name "Subway"). Since the 1990s, ongoing renovation work has resulted in most stations adopting individual colour schemes. The trains' initial orange livery of 1980 (with a white stripe) was soon replaced by a darker, more durable shade of orange, itself now being replaced by SPT's latest, carmine-red and cream livery. The system is unusual compared to other metro systems as it has never been expanded from its original route, although ambitious plans were unveiled during 2005. Many schemes for extending the system have been proposed but none has come to fruition owing to the cost of providing additional bespoke rolling stock, and technical problems — tunnelling beneath the city is difficult owing to its geology, which is composed of solid rock and abandoned mineshafts making underground construction hazardous and expensive. Kelvinhall subway station, showing the new signage. 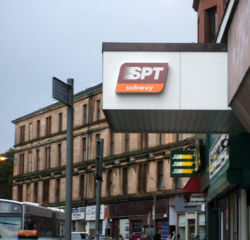 In early 2005, SPT announced that they would employ consultants to look into extending the system in the West End, East End, Southside and Glasgow Harbour areas of the city. The extension will take advantage of existing unused tunnels underneath the city, and there is a possibility that roads will be dug up to install tunnels before being replaced and resurfaced (cut-and-cover tunnelling). The plans are expected to take twelve years to come to fruition. In the mean time there are plans to replace the fleet of trains and to install new electronic destination signs in stations. The trains themselves are undergoing a minor refurbishment which is being carried out by Alstom (the successor company to Metro Cammell, the original manufacturer of the trains) at its Springburn works in North Glasgow, although they will be expected to be life expired within the next 10-15 years. At the moment, the Partick Interchange project is under way which will result in a complete re-development at the station which hosts a rail station, a subway station and a bus terminal on the outside. Should the long-awaited Glasgow Crossrail project get the green light, then West Street station will be redeveloped as an interchange between the new surface railway and the Subway. This is projected to be completed by 2010, if funding is made available. 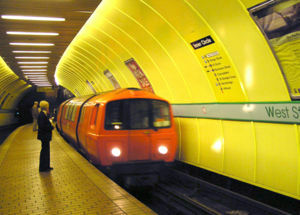 The underground has passenger links to the main railway system at two locations — at Partick, the system connects with the North Clyde line and Argyle lines of the Glasgow suburban railway network, and Buchanan Street station is connected to Queen Street main-line station by a moving walkway. Glasgow Central station and Argyle Street railway station (for the Argyle Line) are both a short walk from St. Enoch, and most stations connect with bus routes. Kelvinbridge — For Great Western Road and Kelvingrove Park. Park and Ride. Bridge Street. Park and Ride. West Street. Park and Ride. Shields Road. Park and Ride. Kelvinhall (named Partick Cross before modernisation). A subcrawl is a favourite pastime for Glasgow students. It is a pub crawl using the Subway to move from pub to pub. The nearest pub to each station must be visited, leading to a total of (at least) fifteen drinks consumed. See binge drinking. On a similar theme is the more traditional ‘Half & Half Tour’, referenced in Iain Banks’ novel Espedair Street as the ‘Clockwork Orange Pub Crawl’, where the participants must consume one measure of whisky and half a pint of ‘Heavy’ (80/- ale) in each establishment visited. 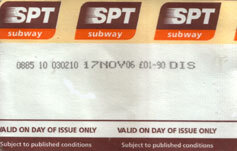 A ticket on the Glasgow Subway, unlike many other underground systems, does not use a distance-based fare structure. A ticket allows a passenger to stay on the underground for as long as they like. Excluding the Discovery Ticket, all child prices are half of those of adults. Single and Return tickets can be purchased for travel on the same day. Discovery tickets allow unlimited travel on the underground for one day but can only be bought after 9.30am. 10 journey, 20 journey, 7-day unlimited and 28-day unlimited tickets can also be bought. All tickets are bought at any station. Tickets must be placed through a machine to validate the ticket before a passenger can access the platform. Once on the train, tickets are rarely checked but SPT advise that passengers keep their tickets with them in case of inspection. The origin of the Subway's nickname, ‘The Clockwork Orange’ (coined from the title of the book and film A Clockwork Orange) is subject to dispute. Some believe that it was originally coined by the media of the period, whilst others credit it to the then chairman of British Rail, Sir Peter Parker, who was quoted in a late 1970s publicity video of the new trains as saying "so these are the original Clockwork Orange". Most of its carriages were painted orange, the corporate colour of SPT at the time. Some of the units have since been replaced with a new colour scheme of carmine and cream with a thin orange band, which will be implemented progressively throughout the fleet as cars are refurbished. While the ‘Clockwork Orange’ nickname is often used in tourist guidebooks and local literature, most Glaswegians refer to the system by its historic (and now official) name — ‘Subway’. It is rumoured by locals that during the late 1950s the Subway took on a new nickname of "Sputnik" as the tube took approximately the same amount of time to go round as the more famous probe. 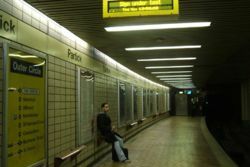 The celebrated Glaswegian writer and broadcaster Cliff Hanley composed a satirical song about the pre-modernisation era Subway entitled The Underground Song. It was popular as a stage piece performed by the comedians Rikki Fulton and Jack Milroy in their Francie and Josie act. ↑ Irlam, Michael J.. A Scottish District Subway. Mike's Railway History. Retrieved on 2007-01-10. A short history of the Glasgow Subway. Collection of Google Earth locations of SPT Subway stations (Requires Google Earth software) from the Google Earth Community forum. This page was last edited on 16 February 2007, at 02:51.